By Rebecca Nickols on November 13, 2010 Visit Rebecca's Website. 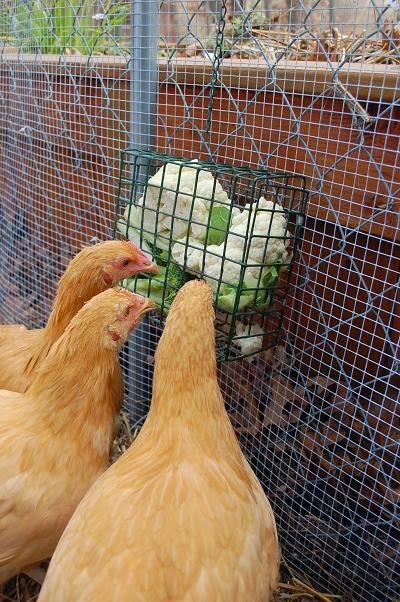 I’m not able to let my chicks free range … too many wild and domestic predators. Some threats are obvious: foxes, hawks, raccoons, etc. And then there are the less inconspicuous dangers, namely Buddy and Sugar, the border collies, and the five chicken-hungry hunting cats. I don’t think the dogs would purposely hurt the birds, but they would torment the chicks by constantly herding them to wherever they felt they should be. Actually, I think the dogs are glad we got the chickens, because it’s just one more reason we have to go outside — and another opportunity they have to try to get us to throw their tennis ball again and again. Not letting the chicks out to explore and forage for bugs and foliage, makes for a bored and restless bird. I’ve been throwing the remains of the flower and vegetable gardens into their pen and they seem to devour everything. I’m not saying I spend all my day thinking about how I can treat my chicks, but I do think it’s important to know what plants/foods should be avoided — those that could be poisonous or harmful. And … I have to admit it’s fun to watch them get excited when I approach the run and fight over a tasty new snack! Here’s a link to possible toxic plants — it’s a little overwhelming, but I’ll narrow it now to the things that I might actually consider feeding them. Raw, green potato peels seem to be at the top of every list of what NOT to feed your flock. The green peelings have a toxic substance called Solanine — high levels can affect the nervous system and cause death. Also included on my list are daffodils, tulips, rhubarb, foxglove, ivy, morning glories, poke, lantana, rhododendron, hydrangea, chives, onions, milkweeds, trumpet vine, sweet pea, sweet potato vine, sage, citrus, avocado, dried or undercooked beans. As for treats, my birds seem happy with just about anything I throw to them. I’ve read some will not touch certain herbs/plants, but mine will eat anything, probably out of boredom — the fact that they’re not allowed to free range. A bird with access to the outdoors has the advantage of being choosy and would more than likely not overindulge on a questionable plant. 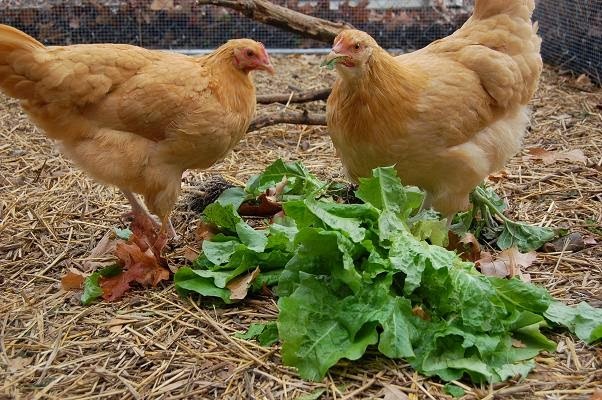 The most popular chicken treats according to other poultry enthusiasts are: oatmeal, grapes, yogurt, popcorn, salad greens, berries, pasta, sunflower seeds, apples, broccoli, cauliflower, bananas, melons. I’m sure for those of you with a flock — a jumping chicken is not a rare occurrence, but the first time we witnessed this behavior we could not stop laughing. They acted more like dogs than birds. 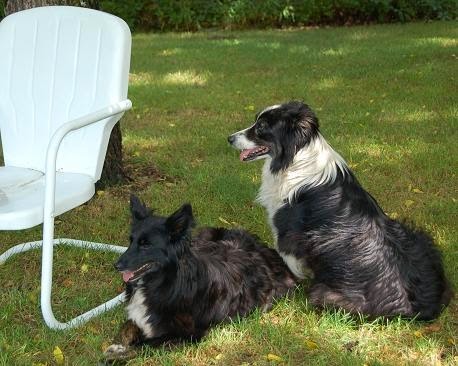 Perhaps they are more observant of the border collies than I realize! Anyway, I wanted to share my “Jumping Chickens” video. Wish I could say we trained them to jump for treats, but they are just excited, happy chicks! I give mine raw peanuts and raw shelled sunflower seeds. My girls free range in the afternoons when the dogs are in so they can be a little picky (they snub the broccoli no matter how finely chopped) but they will chase peanuts across the yard and step on each other to get them first. Both sunflower seeds and peanuts add much needed protein in the winter when bug protein is scarce. The other “treat” I give them is crushed egg shells. 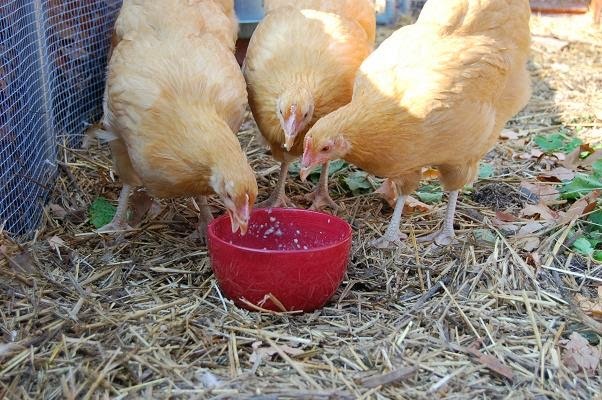 They go crazy for them too and it helps keep their own egg shells hard. And in the summer/fall, tomato seeds. When I gut a bunch of tomatoes for salads or salsa, they just love the innards. Thanks for the list, I’ve got most of those plants in my garden so I won’t purposely give them any. OMG, your video is adorable! They’re like excited puppies!